Women’s Fashion in the Roman World | What song the Sirens sang . . . Throughout time, clothing has morphed from a sole necessity of survival to a luxury of status. Fashion has defined individual groups of people and put a significant barrier between classes such as nobles and slaves. Several other groups can be ranked through what they wear and how they conduct themselves. The Roman people loved their material possessions. In fact, there were several types of merchants that came from all over the known world to bring exotic things to the wealthy class. These exotic things could have been part of the cause for that significant barrier clearly observed between wealthy and deprived. 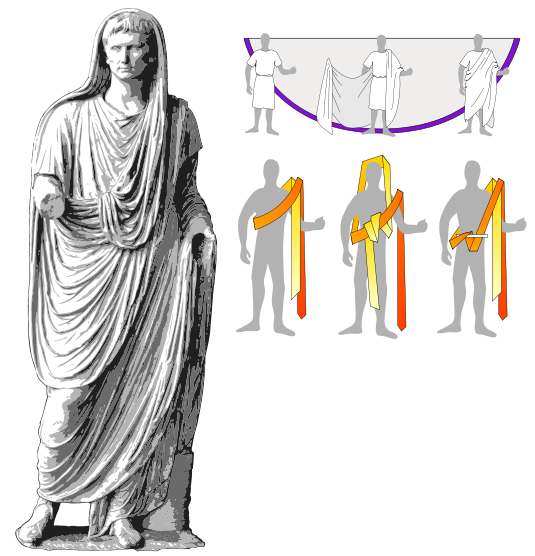 Stolas and togas were mainly worn as the basic form of clothing for the Roman people. Depending on your status, you either added to or took away that basic form. Jewlery and ornamentation was also used to show status. We have seen glimpses of this while looking at evidences in Pompeii. “As Rome’s empire grew richer, ordinary people could afford gold rings, and rich people wore rings that were truly massive. Some rings bore their owner’s name” (Williams 26). Roman women also received engagement rings when they were betrothed to be married. “An engagement ring was often made of iron, so that only its jewel gave it material value; but we know that there were rings of gold because it is said that sometimes on engagement ring was the first bit of gold jewelry a girl possessed” (http://www.classicsunveiled.com/romel/html/clothwomen.html). Puella Inguena, a Freeborn girl, would wear a toga praetexta and had braided hair tied with a vita, luna. A toga praetexta was also worn by freeborn boys and could have just been what brothers and sisters alike wore as day-to-day clothing. 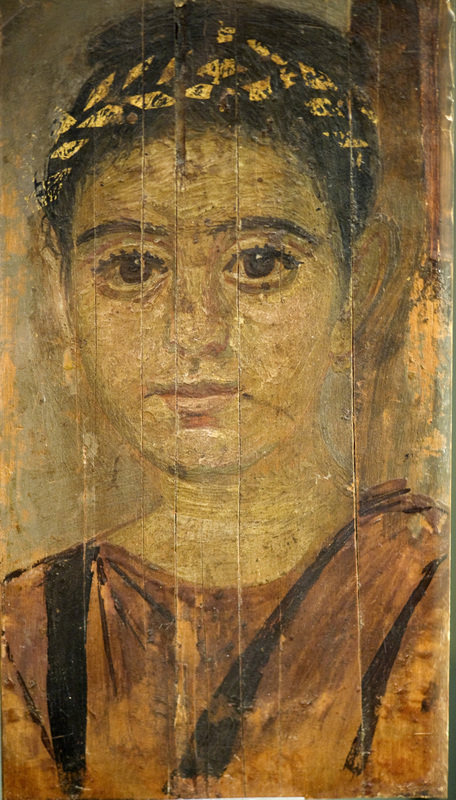 This kind of toga, as seen in this portrait of a child, was based from an “adult male’s but had a narrow, reddish purple woven border along one long edge” (Sebesta 46). An adulteress or Adultera “was not permitted to wear the stola and vittae. Instead, according to custom, the woman divorced of promiscuity wore a plain toga. The symbolism behind the assumption of the toga would seem not to be that the woman had assumed the sexual freedom allowed males, but that she ahd lost her status and role as a sexually mature woman in Roman Society” (Sebesta 50). Viduas (widow) possibly wore a ricinium, stola, and vittae. The ricinium was for everyday wear for women- the equal to a men’s toga. As time passed, the ricinium, now a dark colored material made out of wool, was used as a sign of mourning. Olson, K. (2008). Dress and the Roman Woman: Self-Presentation and Society. New York: Routledge. Sebesta, J. L. (2001). 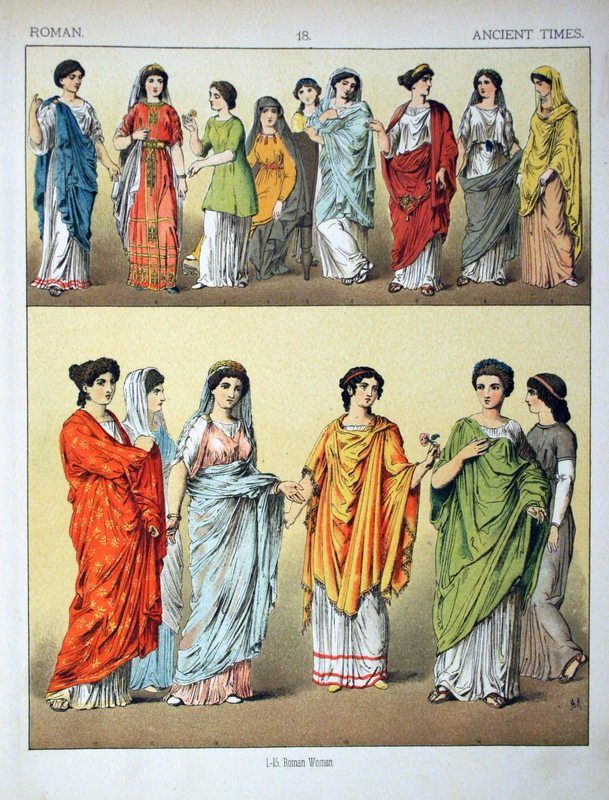 Symbolism of the Costume of the Roman Woman. In J. L. Sebesta, & L. Bonfante, The World of Roman Costume (pp. 46-53). Madison: The University of Wisconsin Press. Williams, B. (2003). Ancient Roman Women. Chicago: Reed Educational & Professional Publishing.